To get a beautiful and luscious curl, I have used both curling wand and curling iron. Both will give great curls, and thus beautiful looks, with the iron having a clip in it, and the wand being the Clipless iron. But since both are named different, designed quite a bit different, and priced differently too, people seeking a curling machine often get confused when it comes to choosing between the two. Heating: Heating speed in a curling is generally a couple of minutes. The barrel gets heated within minutes to give the hair beautiful curls. Heat settings: The iron I use runs on only one heat setting. It cannot be increased or decreased. The iron can simply be put on and off. However, there are other types of irons with more than one heat settings, and this can go up to 10 levels off heat adjustment. Barrel size: On this size depends the size and tightness of the curls. If the barrel is narrow, the curls would also be smaller and tighter. A wide barrel means you would get bigger curls. Heating plate: There are three types of heating plate materials that are normally used, Ceramic, Tourmaline, and simple metal. Sometimes a combination of ceramic and tourmaline is also used. The iron I have been using is a ceramic one. The ceramic and tourmaline ones which are more expensive models protect the hair strands while heating, and resists damage to hair. The metal ones are less expensive, and offer less protection. Interchangeable barrels: There are irons with this special feature that allows you to change of barrels. I can work with one barrel, and then change it and fit another barrel of different size to suit my needs another day. This way I can get curls of different sizes from the same iron. Check out one of my curling iron reviews here to know more about irons as you exactly get to know how these features helps in creating curls. Heating: Heating is so fast, that I need to be cautious that I put on the safety gloves so that I do not burn my fingers. I grew more habituated with its use, I didn’t need the gloves. Wand barrel shape: Shape of the curling barrel is tapered in front of wands. This makes curls tighter and smaller at the end of the hair strands. No holding clip: As there is no clip to hold the hair in place like the iron, the curls come out even and smooth without the mark of the clip at the tip of the strand. Durability of curls: Curls done with the wand stays all day and night as the heating is strong. 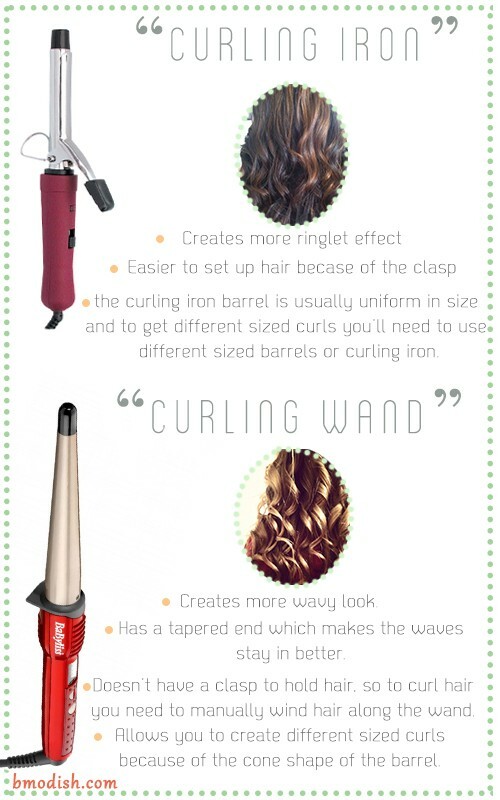 Check out one of my curling wand reviews here to know more about wands. Structural: There is no clip in a wand which makes curls without the clip mark that looks like a small indentation mark, but with an iron this mark appears in every strand. Speed: The wand heats up faster, and gives results much faster than the iron. Smoothness: Curls are lot smoother and shiny when done with the iron. However, a wand though gives gentle beachy curls, yet doesn’t give that finish to the curls. Personally, I prefer a wand when going to normal outing and parties and am in a rush. Otherwise for a better finish the iron is good. Hold the handle of the wand with one hand. Hold the strand of the hair with the other hand, preferably with gloves to avoid any chances of burning your fingers. Wrap the strand of hair from root to tip (in case of wand only) and hold it there for 5 seconds. Gently pull out the wand from between the curls. Here is the video which elaborates how one can use the wand to get curls of different style and texture. Now in case of an iron the technique differs a little. The wand comes with a clip to hold the strand of hair within like a clamp. Then you just roll the iron over the strand of the hair. The key difference here between the wand and the iron is, you wrap the hair from tip to root, and need to hold it for more than 5 seconds, say in 10 seconds or a little more. Here you won’t need the gloves to protect your hands as the clamp will hold the hair, and the curls will be clearer and more noticeable, and a little flattened because of the clamp. Moreover the tip that will be clinched at the clamp will remain straight and look like a small indentation mark at the end of the hair, but that doesn’t ruin the looks in anyway. If speed is your concern, then curling wand stays ahead. If perfection and smooth shiny curls are the ones you aiming for, then I suggest going for the curling iron, as it presses the hair for a longer time, and the non stick coating of the iron brings in a shine to the hair. On using a tapered barrel wand, You could get curls with rings that gradually get smaller at the end. Curling iron can’t give varying ring sizes as their barrels are uniformly measured. If you are going for a quick curling session, yet want long-lasting curls, and bother less about shine, then curling wand is my machine. However, if I plan to go to some wedding or big party, where I will need shiny curls with a great finish, then I invest a little more time with my iron to get that look. Hope this article provides the most insight on curling iron and wands. If you’ve anything to share, do post your comments below.